The classic Novation Bass Station, reworked for the 21st Century. "I was never sold on hardware analog synths but I just got a Bass Station II and i'm having a blast. Good stuff." Orbital's Paul Hartnoll talks about his experience with the Bass Station II synth: "…having spent years using Novation stuff, I know the quality of it. But with all these modular synths that I’ve got, big polysynths and things like that, I tend to think, really what’s another little mono synth gonna do for me? I have to say I was incredibly surprised when I started playing with it, and it has sat here and it’s helped me finish my album. I used it the 1st time and thought ‘Oh, thats good.’ I got a baseline out of it which was just what I needed at the time, instead of turning to the System 100 M (which is what I’ve been going to recently). It really did nail the job. And I’ve been going to it ever since for bass and lead, actually. It’s been pretty amazing! It’s got a really nice *bouncy* sort of sound - rubbery kind of sound. Some synths you find you have to really push them into a mix. But this, just kind of sits in there. The overdrive before the filter is amazing. I’ve been finding that just gives you that extra punch. It’s been really good for basslines, bass sounds. It’s instantly got that bit of velocity to it as well if you want it. For me the first thing I noticed about it - apart from helping me troubleshoot the last few tracks of my album - I found this has been doing nearly all the basslines in that job. Not ALL the baselines in the album, but all the ones that are broken that need fixing. I haven't had to go out to the modulars yet, which is saying a lot!" At 1:45 in this live performance video, Bonobo can be seen using a Novation Bass Station II. "Our latest synth addition to the studio. The Novation doesn’t look like much and is rather cheap, but after using it for a few months now we’re both really impressed with the versatility of this machine. Especially the arpeggiator is fantastic and gets used a lot – not just for the Bass Station itself, but for all of our synths and samplers." - [Session Victim](http://www.attackmagazine.com/features/my-studio/session-victim-studio/#). Shooting a special w @wearenovation @beatport & @dubspot for the bass station 2. Just got sent this through from @wearenovation. Time to have some fun for a bit! Through his love for analogue synthesizers and after seeing various reviews, Tom’s attention soon turned to the Novation Bass Station II. The feature that immediately stuck out for him was the power over USB - “there’s something so great about just having one cable. You can plug in, and it works great as a synth and a controller as well, so it’s a great all-in-one controller mono-synth.” “Also I thought the filters sound really great. There are some weird, very musical resonances coming out which I haven’t really heard in other filters before. And also the fact that it felt very flexible, in that it can be quite sweet sounding or very aggressive very quickly. That’s something I haven’t really seen in a lot of synths. I can get really nasty and aggressive if I want to, all within the synth, and not having to drive it through other stuff, so that’s pretty cool." Timo Maas uses Novation Bass Station II Analogue Mono-Synth and says, that it is a "lovely natural analogue monosynth, creating big, angry and phat-sounding basslines". He says also, that it was used on many tracks and remixes. Cian uses the Novation Bass Station II live, and here is evidence that he's made a signature sound pack for Novation. I can confirm that I've seen Cian using the new basstation live - at the Lunar Festival, Tanworth, in 2016. Sascha can be seen playing Bass Station II on their current tour. Vidéo réalisée en Décembre 2015 // December 2015 – 0:44 - 1:05 "En concert j'utilise Ableton Live qui est piloté par le SL-Mk II (NOVATION) et le Launchpad Pro (NOVATION) qui est un hub qui va me permettre de piloter plusieurs synthés dont un Bass Station (NOVATION), un Tetra (DAVE SMITH INSTRUMENTS), un VERMONA [Mono Lancet]" => "In concert, I use Ableton Live which is controlled by the SL Mk II (NOVATION) and the Launchpad Pro (NOVATION). The Launchpad allows me to control several synths : the Bass Station (NOVATION), the Tetra (DAVE SMITH INSTRUMENTS), the VERMONA [Mono Lancet]"
Dominik Eulberg posts that he is doing a remix for Stephan Bodzin. In front of his monitor a Novation Bass Station II can be seen. You can see that Nitemoves is playing with the Novation Bass Station II Analogue Mono-Synth in this video. At 16:18, Kay shows her Bass Station 2. Protonica making a Bass Station 2 editor.. "Final testing for the upcoming Protonica Bass Station 2 Editor for Ableton!" Seen clearly at the 2:05 minute mark. "Back in my lab finishing my rmx for my friends at @SAFEMUSIC_LABEL and finalizing a new record for @Kdope50 "
In the background throughout the video, you can see a Bass Station II. 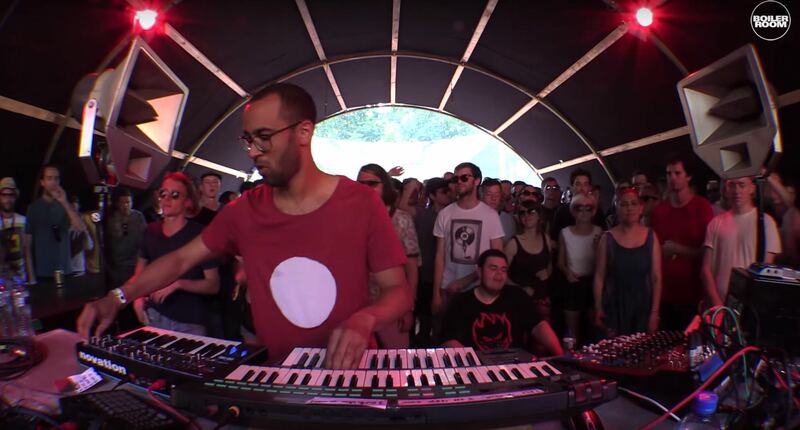 Here you can see Bas Bron (the group's producer) performing under his alter-ego Fatima Yamaha at a Boiler Room set. 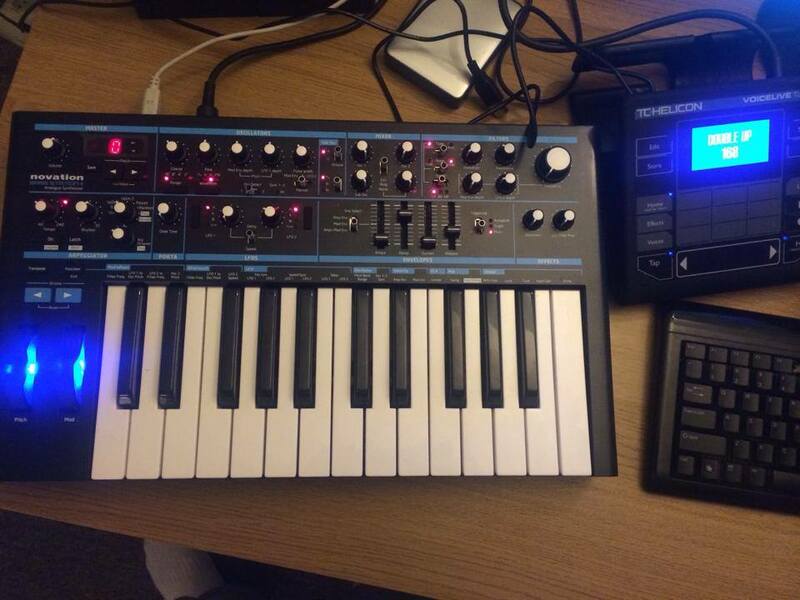 A Novation Bass Station II can be seen on his right side (left side on the picture). You can see His Bass Station II at 8:28 next to his Push. In this live performance, you can see Maya using the Bass Station at 2:36. A Bass Station II can be seen at 0:55. Tom is showing his "organised mess" bedroom studio. voici un video: "Interview de Jeremy Pritchard sur NOVATION Bass Station II artist pack (La Boite Noire)"
"For composing I usually use VIRUS TI, NORD LEAD 2 x, NOVATION BASS STATION 2, CUBASE and VSTs." At minute 3:05 of this video, Sanae Yamada plays with **Novation Bass Station** and **Prophet 6**. Short video of Karina horseing around with Steffen’s bass synth. The signal path is pure analog - including the effects section. The hardware has been laid out in modules with dedicated pots, switches, sliders and buttons for all major parameters. Critically, you can store and recall patches on Bass Station II. It comes with 64 killer factory presets, space for 64 of your own sounds on the hardware, and you can store more on your computer. The key-mechanism consists of 25 full sized keys that are velocity sensitive with assignable aftertouch. It has been developed as a ˜synth-action' keyboard, where each key is individually sprung so it is light to the touch and highly responsive to the synth engine. Bass Station II is a fully class compliant MIDI device with MIDI I/O on 5 pin din ports - for connecting to other MIDI outboard - and can interface with your computer over USB. Oscillators: Bass Station II is built on three analog oscillators and a noise generator. There are two fully independent oscillators plus a sub oscillator (which is the critical component in creating rich, analog bass sounds). Oscillators One and Two are switchable between sine, sawtooth, square and variable pulse width, and Oscillator Three - the sub osc - can be set to one or two octaves below Oscillator One. It can be square, sine or narrow pulse width, delivering the characteristically ˜fat' bass tone. Filters: You can select between two discrete filters - ˜Acid' or ˜Classic' - each with a built in overdrive for pushing filter tones from dry, to warm, to nasty! The ˜Classic' Bass Station filter can be switched between low pass, high pass and band pass at 12 or 24dB slopes. The ˜Acid' filter is based on a diode ladder filter design that delivers a characteristically 303-esque sound that is designed to squelch! Effects: Bass Station II has two effects (not including the filter overdrive). Analog distortion drives circuit components to add new frequencies to the sound. Bass Station II's Distortion function can add gentle warmth, filthy granularity and anything in between. The second effect is ˜Osc Filter Mod' which creates a distinctive FM-type sound by using Oscillator Two to modulate the filter frequency. This is very good at crunchy, sound-mulching effects that substantially fatten up bass and lead patches. Modulation: There are two envelope generators and two low frequency oscillators (LFOs). The first envelope is an ADSR amp envelope and the second is a mod envelope that can be used to modulate filter frequency, oscillator pitch and osc pulse width. LFO One is dedicated to pitch modulation whereas LFO Two is used to modulate osc pulse width and filter frequency. Although it looks like there are four LFO waveforms, the ˜LFO Slew' function can be used freely to sculpt LFOs into smoother wave-shapes. Arpeggiator and step sequencer: Bass Station II's Arpeggiator and Step Sequencer are killer performance and production tools. The Arp can be directed to run through 32 different rhythmic patterns in different directions with a switchable octave range. The fun really starts when you engage the Step Sequencer. Up to four sequences can be played in - with legato and rests - and assigned to any one of the 32 rhythmic patterns. As well as getting ideas down quickly and programming performance sequences, this is a brilliant way to preview patches while you are editing them. Excellent sound quality, extremely versatile, and a price that's hard to beat. Love everything about it, except that filters evidently cannot be controlled via MIDI. I might be wrong about that, though. I love my Bass Station. Every time I traipse through it I find some new sound that I can jam on for hours. You can definitely control the filters via Midi CC. Page 21 of the manual. Such a wonderful analog monosynth! This is not my first synthesizer at all. I've probably had 10 total. This is my first digitally-controlled analog synth though. I wanted a true analog monosynth with patch memory, a small keyboard and a sub oscillator. It was between this, the Korg Monologue and the DSI Mopho. The Korg doesn't have a sub osc and sounds generic and metallic to me and the DSI is hard to program and much more expensive so I went with the Bass Station. The other main selling point was the sound. It does have a very creamy fat analog sound that reminds me of vintage Rolands. The Bass Station name is a throwback to Novation's original Bass Station from the early 90's but this synth is completely different, and while it excels at bass, it also handles leads wonderfully. The built in sequencer and arpeggiator are really nice too. It also sends midi notes from the arpeggiator which is pretty amazing. Pro tip- always add FX to your analog synths. They come out sounding dry otherwise. I typically add some reverb and chorus or delay and this thing will hang with any other synth with those basic FX added. Future classic and a must have! The best Bass Station so far. Don't get fooled by its size or price or name. This is one of the best analog monosynths for the moment and can do so much more than what it name would suggest. This is a future classic and a must have for every synthesist! A very nice and affordable analog mono synth. This is the first analogue synth I bought and it met all my expectations. It's taught me a ton about signal flow, LFO, OSCs, etc. It's a staple in my studio and I couldn't create the way I do without it. This was my first synthesizer, and I wouldn't easy part with it. Its incredible for the newbie to learn on, as well as a great addition to the collection of a seasoned pro. Must-have! This was the first synth I purchased when I got back into making music this year. It is a solid bread-and-butter monosynth that makes an excellent pairing with any polysynth. It is well worth the price of admission, especially if you don't have any other monosynths. Great for acid lines that sound just a little different than the 303. While it's a mono-synth, you're given two oscillators and a sub oscillator that you can de-tune against each other and get some fat sounds. I'll typically have the sub an octave below the main oscillator, and the 2nd oscillator a 5th above the first, and it really kicks out some epic lead or bass lines. 32-step sequencer that you can save four of, and a totally usable arpeggiator? Done. Full-size keys and an all analog signal-path for $400? GTFOutta here, this thing slays. Run it through a delay/reverb and you're in business. Oh, and you can shape some wicked kick drums and snares with it. Monophonic synth, old BassStation classic analog on steroids. Beautiful distortion and overdrive, osc filter mod. Useful step sequencer for internal and external hardware work. 2 classic side octaves, nice keys. Warm and strong sound. good all rounder of a machine. It may not have the quirkyness of vintage gear but what it does, it does well and is pretty versatile. Very enjoyable for messing around with. powerful synth for the money....until you're ready to pony up for a real Moog, this is cool, and has lots of good features like the arpeggiator and aftertouch and presets. dig it. I gotta say that the Novation and Artuira stuff is not in the Moog cmap at alla nd I eman that in a good way. They are far more aggressive, more in the roland and seuqnetial circuits style. I eman, if you're really just going for bass nothing does it quite like a Model D or Sub phatty/37 to my ear, but you don't always want that sloshy, deep moog sound and these other alternaitves are tighter and punchier without processing. Don't be thinking a Moog will replace a Novation, you will wanna keep both. One of the coolest sounding synths out right now!! Fantastic synth, love making sounds on it. Easy to get lost in the sound! Analog monosynth. I use this for bass lines, noise, leads, arpeggiated stuff, f/x, etc. Perfect analog solution on a budget. Extremely versatile. Can even use it for amazing pads when fed through reverb/delay. The Bass station is versatile, in expensive and is my "baeeee". This synth has made the writing process easier. If you want a great bass synth this one is for you. Do you need a good lead synth? Got you covered. Do you want to make some pads or get some really spacey sounds? It works for that too. Outstanding all around mono synth.